With so many different options for rivets, it can sometimes be difficult to determine exactly which type of rivet is most appropriate for the application. At Universal Rivet, we are pleased to provide an extensive supply of various types of rivets, including shoulder rivets. This type of rivet features a manufactured head on one end, with a solid shoulder located beneath the head. Shoulder rivets also include a smaller-diameter shank, which may be solid or have a tubular or semi-tubular hole. A variety of different types of raw materials may be used to produce such rivets, including brass, copper, aluminum, stainless steel, and steel. 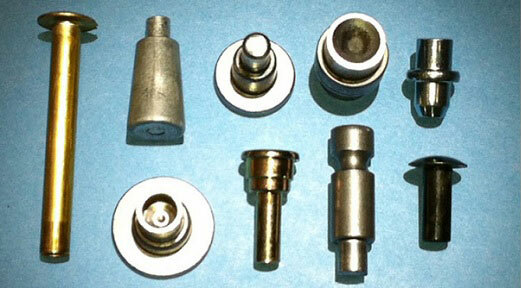 Depending on the specific application, various coating and rivet plating options are also available. One of the benefits of a shoulder rivet is that the shoulder portion serves as a bearing surface while the shank is clinched tight to the workpiece. In assembled workpieces, shoulder rivets can serve as stops, slides, or guide points. Among the most common reasons that many facilities choose shoulder rivets is actually their rate of high-speed assembly. In fact, shoulder rivets can be easily adapted for automation. With a spin/orbital machine, clinching cycles can be completed in five to eight seconds. In an impact rivet machine, cycles are completed within 3/10 of a second. After the shoulder is riveted in place, it can be easily press-fit into keyway holes using a rubber mallet. This type of rivet is also ideal for use in situations in which either similar or different materials need to be fastened on multiple workpieces. This is why shoulder rivets are most commonly used for applications involving hinging or pivoting joints. When you have an application that needs to be fastened permanently, while still allowing the ability to pivot, shoulder rivets are the best choice for the job. Set tight into the base material with the shoulder serving as a load-bearing surface, shoulder rivets provide the stability and flexibility needed for a variety of applications, including use in furniture and with small hand tools. At Universal Rivet, we offer only the highest-quality shoulder rivets, manufactured from the most durable materials to ensure they withstand the test of time.